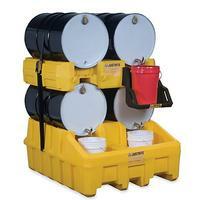 This 3-piece polyethylene drum containment systems consists of a base module, stack module and dispensing shelf. The base module holds (2) 55-gal. drums with a 100 gal. containment sump (exceeds EPA regulations). A double dispensing well accommodates safety cans or 5-gallon pails. Ribbed bottom keeps containers above liquid resulting from incidental drips. Stack module supports 1,200 lbs. and facilitates dispensing from two levels. Dispensing shelf mounts firmly on stack module to facilitate dispensing.